West Georgia Technical College is planning a new campus in Carroll County to replace its current 50-year-old facility, provide additional space and expand instructional offerings. The campus will be located on about 40 acres in the Buffalo Creek Technology Park near the west end of the Hwy. 166 Bypass in Carrollton. 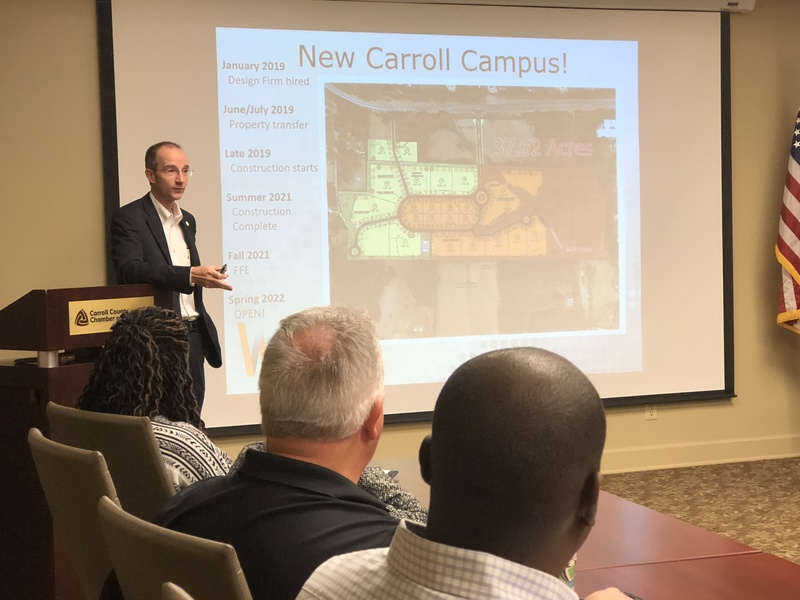 Carroll County and the City of Carrollton developed the Tech Park and the Carroll County Development Authority has committed property there for the campus. Rule said the Technical College System of Georgia has requested an additional $49.4 million in next year’s state budget for campus construction. As part of the state budget, these funds will need to be approved by the General Assembly in its 2019 session. WGTC operates five full-service campuses across seven counties in West Georgia. Over 7,100 credit students are enrolled this fall. Carroll County Area Vocational Technical School opened in 1968, making Carrollton one of the original sites for what is now West Georgia Tech. About 1,700 credit students attend class on the Carroll Campus this fall. About 100 additional students are taking GED prep classes there. Daniel Jackson, president and CEO of Carroll Tomorrow and the Carroll County Chamber of Commerce, said he and his staff have been working with a number of community partners for several years on this project. Jackson said community leaders sat down with Technical College System of Georgia leadership about three years ago and laid out the case for why a campus is needed. “We told them that West Georgia Tech has five campuses and its busiest campus – in Carrollton – is not able to provide the space or the technology that is needed to train students to do the jobs in Carroll County,” Jackson said. “We heard from them that Carroll County needed to step up and put skin in the game. We believe the land committed by the development authority in the Tech Park was the impetus needed at the state level to get the ball rolling,” he said. Local legislators have been instrumental in securing the $4 million in design money this year, and will be crucial to obtaining construction money in future state budgets, Rule said. If construction funds are approved by the General Assembly in 2019, they could be available by August, Rule said. Carroll Tomorrow is assisting WGTC with the necessary job climate assessments to justify new programming that can be offered to fill the job demand in Carroll County, Jackson said. Carroll County Development Authority Chairman Tim Warren said the authority believes investment of land in the Tech Park will lead to more growth. Rule said the new location has a number of advantages. Dugan said he believes the campus will aid Carroll County in continuing to grow jobs.